There are restaurants in Invergarry at the Invergarry Hotel (takeaway food usually available with some advance notice) (01809 501206) and at the Glengarry Castle Hotel (01809 501254), as well as a Gleaner petrol station with a small shop selling newspapers and basic provisions (01809 501288). The Well of the Seven Heads store approximately 1 mile south of Invergarry stocks a wider range of goods, as well as hot drinks and snacks, and groceries can also be ordered in advance (01809 501246). The Thistle Stop Cafe and Gift Shop is 2 miles south of Invergarry. Great Glen Travel Taxi Service in Invergarry offers a taxi service, minibus and coach hire and cycle and luggage transfer (tel: 01809 501222). Fort Augustus has two small supermarkets, a pharmacy, a doctor, a petrol station, a garage, a butcher, gift shops, a tourist information centre and many cafes and restaurants. Fort William has a range of shops, including a number of outdoor, cycling and gift shops and Morrison and Tesco Metro supermarkets, and restaurants, cafes and pubs. There is a Michelin starred restaurant at the Inverlochy Castle Hotel on the A82 three miles north of the town and a farm shop at Torlundy, near Nevis Range (01397 708686). There is a Spar shop at Spean Bridge (01397 712230). There is a Co-op supermarket and also a deli, Buth Bheag, (01599 534002) at Kyle of Lochalsh. 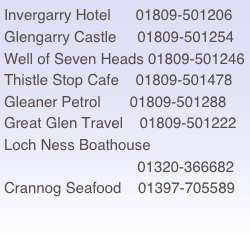 There is a restaurant at the Cluanie Inn on the A87 between Lochan Torr and Kyle (01320 340238). Inverness, the capital of the Highlands, has a wide range of shops, including supermarkets, pubs, cafes and restaurants.